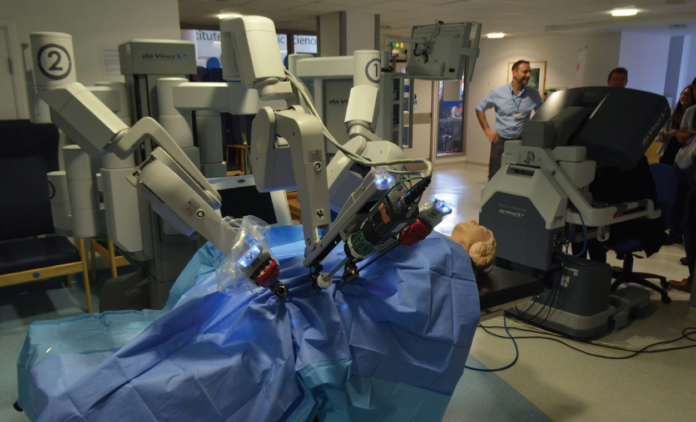 Lillian Loescher explores the world of medical robots, and takes a look at its latest advancement – autonomous robotic surgery. Share the post "Autonomous robotic surgery: The new frontier"
If you were suffering from a major health issue that required surgery, would you trust the warm careful hands of a skilled surgeon in their prime or the cold and lifeless appendages of a thoroughly tested robot? A great deal of evidence continues to mount that suggests trusting the robot will yield a much better outcome. Advancements in technology have allowed for the use of robotic assistance during surgeries for the past three decades with a plethora of positive results. Consider neurosurgery, which requires an immense level of dexterity, precision and concentration from the surgeon. When it comes to removing parts of the brain there are no second chances and the slightest slip-up could cause serious damage. Imagine finding a trusted surgeon who does their best to manually remove a malignant glioma (tumour) from your brain, only to have some neighbouring part of your brain impacted during the surgery, and its function altered irreversibly. Now, post-surgery, you experience balance and coordination problems. But this is a fair trade for getting rid of the cancer, right? Advancements in technology have allowed for the use of robotic assistance during surgeries for the past three decades with a plethora of positive results. Most would agree that spending the rest of your life with two left feet is preferable to having a cancer spread throughout your body. Due to the inclusion of robots (ZEUS, da Vinci and most recently STAR) in the surgical room, complications such as these have greatly decreased in the last 30 years and will likely continue to decrease as time goes on. Robotic assisted surgery has been responsible for decreasing mortality rates, increasing precision, decreasing incision sizes and minimizing patient discomfort for many types of surgery, including, but not limited to; otolaryngologic (head and neck), neurosurgery, cardiothoracic, gastric, and orthopaedic. With the amount of research being dedicated to such advancements, the types and complexity of surgery that a robot can perform will continue to increase. However, these benefits don’t come without a hefty cost. The amount of money needed to buy and maintain such robotic systems remains high. At the moment, that cost can be offset by having the robot help perform a certain number of procedures in a given period of time. This number is determined by the size of the hospital, the type of robotic system used, and type of surgery performed. Studies have shown that despite their high initial costs, these systems can result in savings for hospitals due to lower complication rates and better removal of diseased tissue. Aside from the financial burden that may be imposed on a hospital to obtain and maintain these systems, many of the problems that were encountered in the past with robotic assisted surgeries have been addressed and continue to improve. Perhaps the most notable of these is the problem of haptic feedback, which refers to the sense of resistance one gets from holding or moving an object. This sense is dulled when using robotic surgery, which in the past has led surgeons to rely on visual cues in order to avoid breaking sutures and other structures. To get around this, scientists have developed surgical robots which sense the resistance of such things, and can transfer this sensation to the surgeon. These machines are able to provide this sensation without any degradation in the strength or accuracy of the robot, truly making its limbs an extension of the surgeon’s. With robot assisted surgeries out performing non-robot assisted surgeries, it should not come as a surprise that scientists have been looking into the possibility of creating autonomous robots that are capable of performing surgery on their own. So-called “autonomous robotic surgery” is one of the most current advancements in this line of research. One such robot, the Smart Tissue Autonomous Robot (STAR), uses an array of small lenses that work like an insect’s eye. Each lens sees the patient’s tissue from a slightly different angle. Computer algorithms reconstruct those images into a single 3-D image which is displayed to the surgeon in real time. STAR has also demonstrated an ability to adapt to changing conditions or random movements during its initial animal testing. This kind of flexibility is essential for human surgery. Not only was STAR faster than a human surgeon at stitching, but it was proven to be many orders of magnitude more precise than a human surgeon. Not only was STAR faster than a human surgeon at stitching, but it was proven to be many orders of magnitude more precise than a human surgeon. This robot can literally “see” and adapt to what is on the operating table, and it can outscore surgeons with seven years training on stitch location and stitch tension. Stitching may not seem like the most high-stake aspect of surgery, but poorly placed stitches are responsible for countless infections and complications every year, including poorer wound healing. STAR has not been fully tested on humans, and it is not meant to replace surgeons. So far, it exists to complement the surgeon’s skills in the operating room. As the capabilities of artificially intelligent technologies increase, approaching what is described as a “technological singularity”, the impact on human civilization will be enormous and unpredictable. When talking about artificially intelligent autonomous robotic surgery we must also consider the larger impacts on health care regulation, as well as the ethical implications. This will be no easy feat and at this point is a source of extensive debate among anthropologists, sociologists, historians, scientists and philosophers.